You know what always makes the first part of the week a little brighter? A little less, “Is it Friday yet? ?” That’s right, friends. Taco Tuesday. Because, what less-than-perfect day can’t be forgotten when you have a tasty taco dinner to look forward to?? And it’s even better when those tacos taste better than you imagined they would. 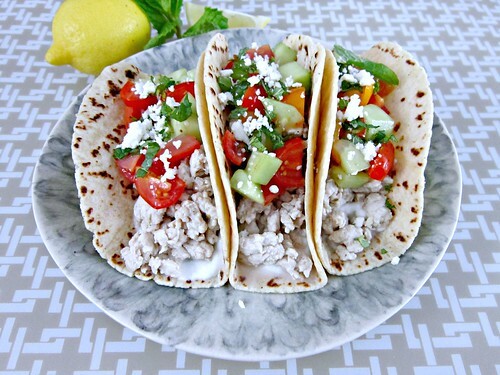 Like these Greek turkey tacos. I mean, I thought they would be good or I wouldn’t have made them, of course. But I didn’t know just how much of a punch of flavor they would have with so few and simple ingredients. J is a hunter, so we look forward to hunting season all year, and mourn when we use the last of our freezer stash in the interim. The guy he hunts with always has a stash long after ours is gone because, sadly, his family doesn’t care for game meat. Sad for him, but lucky for us, as he gave us a good bit recently that included some wild turkey breast. Which also meant that we got to use the meat grinder we bought last season. I’ve bought ground turkey breast at the grocery store a zillion times, but this would be the first time I had turkey in my freezer that I would get to grind up myself. Or that J would grind up, rather. And I wanted to make something really good with it, of course. I’ve made meatballs, and meatloaf, and burgers galore, but not many tacos with this big bird. So, I decided it was high time I revisited the turkey taco. And when I came across a recipe for this particular taco, I knew I’d found a winner. I made a few adaptations to the original recipe, adding a sauce mainly for fear of a dry taco. Ok, ok and because we just love sauce on everything. Can you blame us?? Anywho…these tacos were not dry and bland, but full of vinegar-y flavor and topped with a refreshing cucumber-tomato relish. Oh, and the addition of mint…yep. Good stuff. 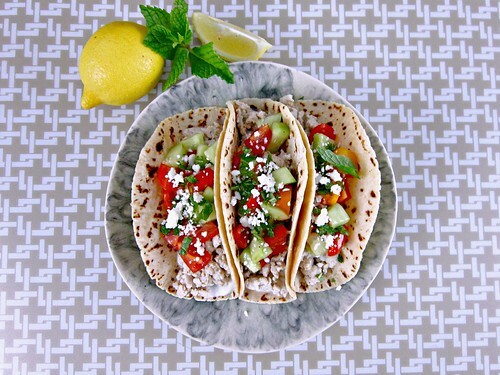 It’s a pretty light taco with all it’s turkey-ness and such, so you can eat them without the guilt of some tacos that are piled high with fat-laden ingredients. This, is not that kind of taco. It’s healthy, refreshing, and delicious. And with all it’s bright toppings, it can help brighten any gray and gloomy day! Heat olive oil in a large skillet over medium-high heat. Add the garlic and saute for about 30 seconds, until fragrant. Add the turkey and cook until mostly browned. Add the oregano, salt and pepper, to taste. Meanwhile, in a medium bowl, combine the tomatoes and cucumber. In a separate, small bowl, combine the olive oil, red wine vinegar, lemon juice, oregano, salt and pepper, to taste. In a small bowl whisk the remaining 1 tbsp olive oil with the red wine vinegar, lemon juice and remaining 1 tsp oregano, ½ tsp black pepper and ½ tsp kosher salt. Pour this mixture over the tomato cucumber relish and stir to combine. In another small bowl, stir together the Greek yogurt, lemon juice, and chopped mint. To assemble, warm your tortillas, top with a spoonful of the yogurt sauce, several spoonfuls of the turkey mixture, tomato-cucumber relish, and a sprinkle of feta crumbles. Yum!!! I love taco Tuesday!